Blow the Egg: Wash and dry the raw egg. Cover your table with newsprint and set out bowls, pushpins, and paper towels. Shake the egg to break the yolk. Next, pierce the top and bottom with a pushpin, making the hole on the wider end a bit larger. Position the egg over the bowl and blow through the small hole, allowing the inside of the egg to seep into the bowl. Set the empty egg, with the large hole down, in an egg carton to dry. Be sure children wash their hands after handling raw egg . Degg-orate the Egg: Let the kids paint half of the egg, stand it atop a bottle cap to dry (use a hair dryer to speed things up), then paint the other half. Centering the face on either hole, paint on features with contrasting colors. 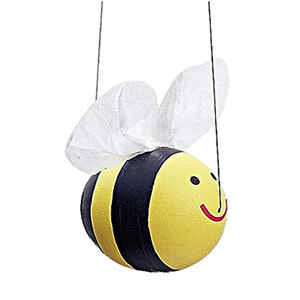 Paint your bee bright yellow, then paint on a red smile, black eyes, and black stripes. Glue on white tissue paper wings. Take Flight: Tape a long length of fishing line to the end of an unfolded paper clip. Starting at the small hole, thread the line through the decorated egg and out the large hole. To keep your flying critter upright, tape the fishing line just above the hole in the critter's back. Hang it from the ceiling or an egg tree.